Your belly button has a proper name, the navel. It is made up of what was once your umbilical cord. It is the scar that forms at the cord base after you are born, and the cord falls off or is removed. If your belly button itches, the treatment will be based on what’s causing the discomfort. Your navel is a warm, moist part of your body, which is why there can be fungus or bacteria within it. When the navel develops an infection, it will become itchy and cause you discomfort. Contact dermatitis may occur on the skin of the navel, and create itchy rashes. Many rashes of the skin may occur in the navel area. If you notice any scales, swelling or redness in your belly button or around it, consult with your physician or your dermatologist to have it checked out. This will allow your health care professional to determine a logical course of action for treating your itchiness. 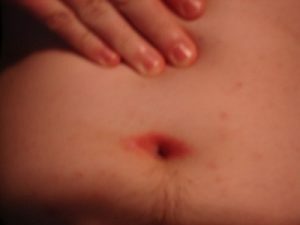 A skin rash around your navel or an infection inside your belly button can also cause the area to become itchy. Rashes in this area have various causes, one of which is contact dermatitis, mentioned above. This allergic reaction develops when substances the body perceives as foreign are used to clean or moisturize the area. This includes soaps, laundry detergents and body creams. Your clothing can also cause a reaction, if you’re allergic to the materials in it or the detergent used to wash it. Your belly button may also develop infections. Lint that detaches from your body hair and clothes may enter the umbilical area, causing swelling or inflammation. If infection occurs, it will usually be accompanied by itching, a foul odor, and in more advanced cases, fluids coming from the umbilical canal. Infections in your navel are fairly easy to prevent. Just be sure that you keep the navel and surrounding area clean. You need to wash it carefully and some people even trim any hair they have in the navel area, which prevents bacteria from growing in the area. Trimming the navel area hair will also ensure that it won’t fall off and enter your umbilical canal. Infections can be successfully treated by cleaning the foreign objects or dirt with hydrogen peroxide. If you develop a yeast infection in your belly button, it will cause it to itch, as well. This can happen to people at any age. Newborns can even develop yeast infections, since they are exposed to the mother’s vaginal yeast when they are born. Other health conditions affecting children, adolescents and adults, like thrush and athlete’s foot, can spread to the navel area, which will cause it to itch. Diabetes or an excess of fat in the abdominal region may increase your risk of a yeast infection in the navel. Symptoms including burning, odor, redness and itching may signify a yeast infection. Your physician can evaluate the situation and offer prompt treatment advice. If you are pregnant, the stretching of your belly skin can cause itchiness of the belly and navel skin. When your skin is expanding, you won’t have enough moisture to keep it healthy. Dry skin can be itchy and uncomfortable. You may choose to moisturize your skin using only gentle skin products, to relieve your itching. Do not scratch the area that itches, or you may open it and make it a likely place for the development of a bacterial infection. An itchy belly button may have symptoms that include pain, soreness and redness, as well as the itching. Bacterial infections can cause soreness and pain. You may even experience a whitish discharge or bleeding from your navel. Infections of the navel can also cause nausea. If you have a belly button piercing that develops an infection, it may cause bleeding, or a gray, yellow or green pus-like fluid to be discharged from the navel. The navel area may experience irritation, pain and inflammation. The itching in the navel may be just one symptom, with others including fever or a higher than normal body temperature. You may find that your physician prescribes one of various treatment approaches for your itchy navel, depending on what caused it to start itching. When you wash your navel, it may prevent the further spread of infection. You can use alcohol to help in cleansing infection. You may also decide to stop using soaps or body washes with strong or harsh chemicals in them. As we mentioned, it’s important not to scratch your belly button, even if it’s itchy. This can spread the infection or even cause a secondary infection. Avoid creams and lotions because they can irritate the skin, which will aggravate the itchiness. Anti-fungal and antibiotic medications are useful in treating yeast, bacterial and fungal infections. Washing the area daily will keep it cleaner and germ-free. Always ask your physician if you notice an itchiness that does not clear up, or if it causes other symptoms like swelling or pain. Next articleWhat Does it Mean when your Left Eye Jumps?